UDM Downloads > Syslog Watcher Pro Edition! 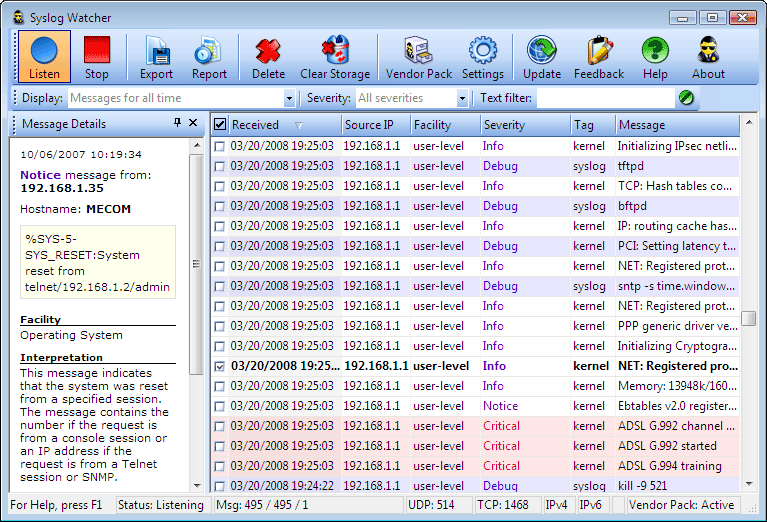 Gather syslog data from network appliances and workstations. Syslog Watcher Pro Edition collects syslog information from network devices via UDP and TCP protocols, and works in IPv4 and IPv6 networks. Syslog Watcher Pro records, stores, organizes and displays system logs, allowing easy and convenient access to raw or processed logs or scheduled reports. Syslog is a modern standard for logging network appliances and workstations. Syslog Watcher Pro Edition empowers your network with a full-featured syslog server that runs on any Windows workstation, allowing easier management and enhanced security for your network. No need to access each and every appliance on the network to view the logs! Syslog Watcher Pro Edition conveniently integrates all of the logs, placing syslogs into a central repository. A central repository makes accessing syslogs faster, easier and more convenient for network administrators. Collecting the logs is important, but raw log files are of little use to everyone but the most experienced system administrators. Syslog Watcher Pro processes the log files, producing error logs and system reports that are easy to read and interpret. Increase network stability by being notified about new system messages with an audible alert or a pop-up window. In case anything goes wrong on the network, Syslog Watcher Pro Edition immediately alerts system administrators. Allowing you to specify for how long the important, less important and routine syslog messages will be kept in the repository, Syslog Watcher Pro ensures that no important message is lost or ignored. Parse both standard-compliant and non-standard syslog messages and glance through millions of records! Both new and professional system administrators will appreciate the support of VendorPack add-on that explains the meaning of over 14,000 various syslog messages. Even amateur network administrators will be able to understand and fix network problems with Syslog Watcher Pro Edition.